How can a small birthday change the lives of people you do not know forever? Watching videos like this reminds me that how lucky i am to be able to sit in front of a computer with a spinning fan and a fluorescent lamp above me. Millions of people around the world do not even have this kind of luxury. And i still have the guts to complain about how hard life is when there's people who are not even able to get a sip of fresh water everyday. And this time, i'm gonna do more than just sit here, write a blog post about how cruel this world can be and just leave it there without doing anything. Because that will be just all talk and no action. 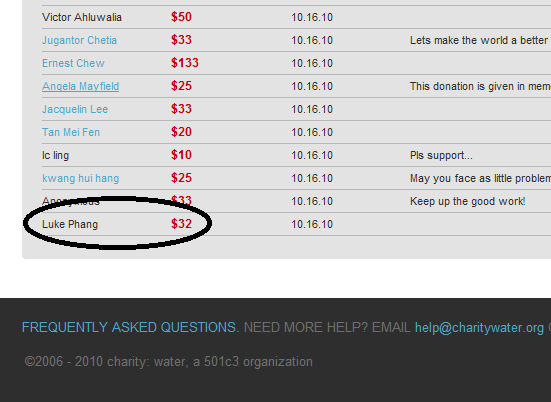 I'm gonna donate 32 USD to Charity : Water just like Scott asked. And since my birthday has just passed, i think it would be great that for once, i'm gonna use my birthday to do something good. Of course, i will not be using the money that my parents gave me for my studies for the donation (don't worry dad!) or it would be my parents donating, not me. Defeats the whole purpose of donating, i would say. In fact, since i'm ranting about this in my blog, the best way would be to use my blog's earning for it. Because i believe that all it takes is one simple gesture, one at a time, to make this world a whole lot better place to live in. Now that i've shown how easily this can be done, and that i'm not only finding some topics to post in my blog, the question would be: Will you be willing to help change the lives of others too? Are you willing to put the money that you have into good use, changing the lives of others, or would you prefer to use it on unimportant personal satisfaction like a new phone? Will you share the story of Scott Harrison and charity: water or are you gonna click the 'X' on top of your browser? All it takes is just one simple gesture to change the world.